JFK Research - Who killed JFK? Thank you for visiting JFKResearch.com. We are an award-winning website dedicated to the life and the assassination of President John F. Kennedy. The site is undergoing restoration and will be launched in the coming weeks. 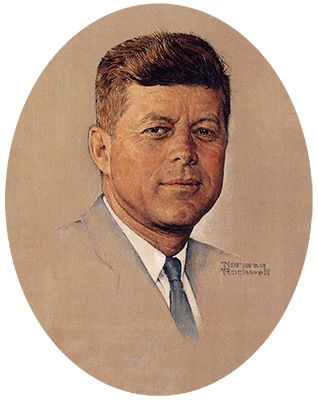 To follow the news about JFK Research, subscribe via the Facebook or Google+ buttons below. That will also allow you to connect with fellow JFK researchers. We will notify all subscribers via Facebook and Google+ as soon as the new site is relaunched. About JFK. John Fitzgerald Kennedy, the 35th President of the United States, was assassinated at 12:30 p.m. Central Standard Time (18:30 UTC) on Friday, November 22, 1963, in Dealey Plaza, Dallas, Texas. Kennedy was fatally shot by a sniper while traveling with his wife Jacqueline, Texas Governor John Connally, and Connally's wife Nellie, in a presidential motorcade. A ten-month investigation in 1963-64 by the Warren Commission concluded that Kennedy was assassinated by Lee Harvey Oswald, acting alone, and that Jack Ruby also acted alone when he killed Oswald before he could stand trial. Although the Commission's conclusions were initially supported by a majority of the American public, polls conducted between 1966 and 2003 found that as many as 80 percent of Americans have suspected that there was a plot or cover-up. A 1998 CBS News poll showed that 76% of Americans believed the President had been killed as the result of a conspiracy. A 2013 AP poll showed, that although the percentage had fallen, more than 59% of those polled still believed that more than one person was involved in the President's murder. In contrast to the conclusions of the Warren Commission, the United States House Select Committee on Assassinations (HSCA) concluded in 1978 that Kennedy was probably assassinated as a result of a conspiracy. The HSCA found the original FBI investigation and the Warren Commission Report to be seriously flawed. While agreeing with the Commission that Oswald fired all the shots which caused the wounds to Kennedy and Connally, the HSCA stated that there were at least four shots fired (only three of which could be linked to Oswald) and that there was "...a high probability that two gunmen fired at the President."